I had a beautiful, heavenly dream this morning, June 4, 2018, I would like to share with you, but first let me provide some details surrounding and leading up to this dream. Last weekend, I attended the Sai Region 3 Retreat in Birmingham, Alabama. The theme of the Retreat was Duty, Discipline and Devotion. We were very fortunate to enjoy some very prominent guest speakers: Dr. Michael Goldstein, Dr. Joe Phaneuf, and a divine personage from India, Dr. Gyamsto. Dr. Gyamsto's sublime voice and melodious bhajans, many of which were composed by him, drenched us in double dipped nectarine sweetness. He shared his divine experiences interspersed with celestial songs which I am sure, angels and deities of other realms also relished. Dr. Goldstein has not been active lately, so it was a pleasure to hear his eloquent and uplifting discourses. Dr. Phaneuf blessed us with interactive communication workshops. I was surprised and very happy to connect with some devotee friends from Little Rock, Arkansas now living in Alabama and Gainesville, FL. They were an integral part of the elaborate planning and execution of the entire Sai Retreat. I returned home from the Sai Retreat with renewed spiritual vigor and enthusiasm. Yesterday, I worked almost all day on my newest painting. At the end of the day I still had some housework to complete which I did not feel at all like doing. I thought about Prashanti Nilayam and how orderly and neat Swami kept the ashram. Every evening the canteen was swept and mopped with diligent duty, discipline and devotion. I took a deep breath, summoned the energy and finished my housework offering it all to Baba. Afterwards, I drifted off into a peaceful slumber and had the following divine dream: In the dream I was in what looked like a combination church and temple, people from various countries and places strolled through this divine sanctuary. 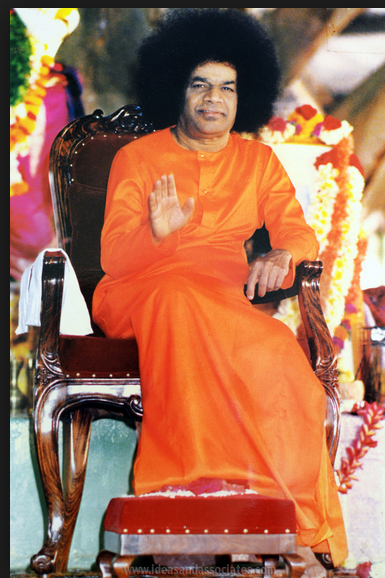 Towards the front of the building there was a stage that resembled Sathya Sai Baba's dais in Prashanti. In the center of the dais was His beautiful chair adorned with ornate wood carvings and rich red velvet cushions. Myself along with some Sai devotees from the Palm Bay Sai center were busy doing work in the front area. Uncle Buddy (the host of our local Sai Baba Center in Palm Bay, FL) said to me. "You were sitting on Sathya Sai Baba's throne, when we first came in." "What?" I said shocked by this revelation. "I don't remember doing that. I would never do that." "Yes," Uncle Buddy insisted. We all saw you sitting there for quite awhile." I looked at Uncle Buddy completely befuddled. "How could that be, I have been working right here with you and the other devotees all this time, unless I went into a trance or another dimension." The other devotees in the group also confirmed that they saw me sitting on Swami's red throne. Our conversation was interrupted by a Japanese group inquiring about something. Then, as the dream started to fade, I stood on the Prashanti dais with Uncle Buddy, we could see the sun rising, softly spreading golden pink rays over the distant horizon. "It's okay," Uncle Buddy, said with a wise smile, "Just enjoy the sunrise."